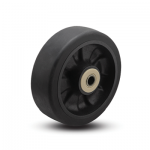 Flat tread available in 4″, 5″, and 6″ diameters. Round tread available in 6″ diameter. All feature 2″ tread width. Select “Flat Black Tread” or “Round Black Tread” in configurator.